From 1976 to 1982 and intermittently thereafter, Skaggs taught Media Communications at the School of Visual Arts (SVA) in New York. In addition to core classroom training, he gave his students hands-on experience to teach them how the media works. Together they conceived, created and executed satirical public performances and promoted them to garner media attention. This was the first class of its kind and was fully supported by the school administration. 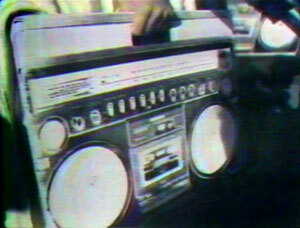 In 1978, disco was hot and boom boxes were big, in every sense of the word. 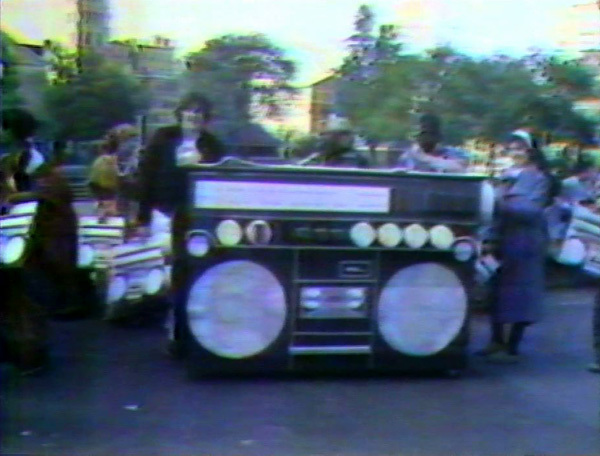 People carted them around in the street and in their cars, listening to their favorite music at very high decibels. To illustrate what could happen if everyone in society disregarded each other’s comfort zones, Skaggs and his students devised a satirical street performance. Using a broad range of multi-disciplinary tools–advertising and public relations techniques in conjunction with performance and fine art, they built and promoted the world’s largest Disco Radio. It was 4 feet tall, 2 feet deep, 8 feet wide and had a very loud radio inside. It was on wheels and could be rolled in the street. 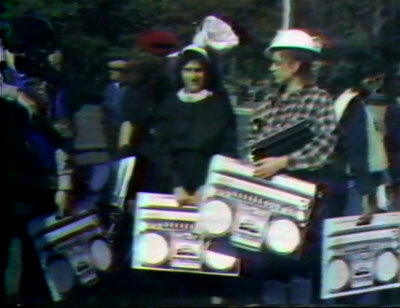 Individual students dressed in costumes and each carried a 2-dimensional silkscreen print of a large boom box with a concealed cassette player behind it, playing music appropriate to their costumes. A nun played Gregorian chants. A steel worker in a hard-hat played patriotic marching band music, A gypsy played Flamenco guitar. A bird-watcher played bird sounds. The class paraded from SVA at E. 23rd Street to Washington Square Park in Greenwich Village where they all played their music as loud as possible. WNBC TV’s Chauncey Howell showed up to cover the event, interviewing Skaggs and his students. Very quickly, in fact, on that evening’s news, the students were able to see the direct results of their efforts.